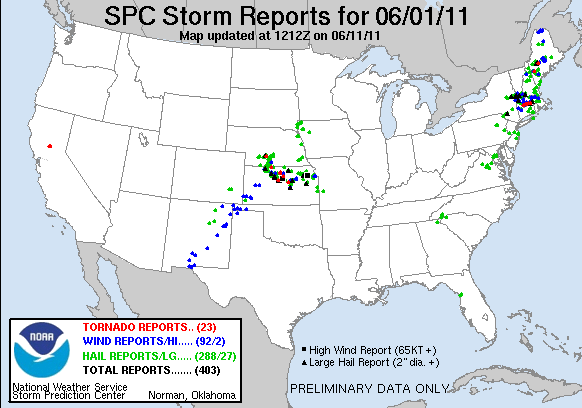 On June 1st, just my second day back to work after returning from my annual storm chasing trip to the Central Plains, Massachusetts suffered it's most significant tornado in over 50 years. 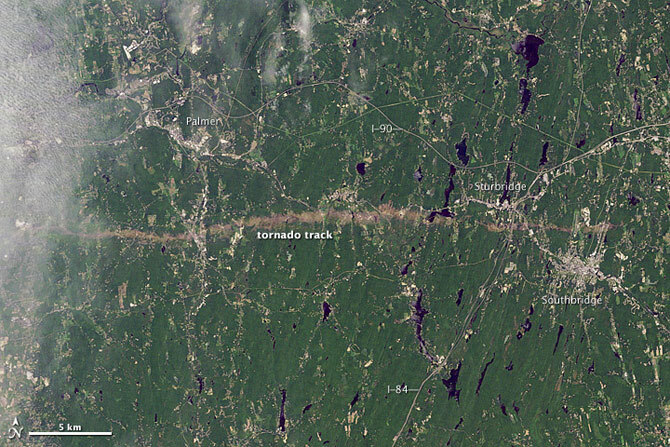 Three tornadoes occurred along a line from Springfield to Sturbridge, MA. The largest of these tornadoes was a long-track EF-3 with a damage path extending 39 miles. Being that I had just returned to work, I could not take the day off to chase, but it was obvious by 10 o'clock that morning that if the cap broke that afternoon, there were going to be very severe and possibly tornadic thunderstorms. I did leave work early with the intent of chasing, and was amazed to hear reports of a tornado on the ground as I drove from work to home in order to get my chasing gear. By the time I got out on the road, the commute traffic had become too heavy to make an intercept possible, and when the tornado warning was extended to include my county, I decide it was best that I pick up my daughters from their day care and make sure we all stayed safe. Luckily the storms weakened significantly before they got to us, though later that night a squall line passed through with some of the most stunning lightning I've in a New England storm. Although I wasn't able to actively chase the storm, 3 days later, on June 4th, we took a ride out of Monson and Brimfield, MA, two towns that had seen the most damage. The tornado had traveled right along Rt. 20, and the damage was intense, with literally thousands of trees destroyed. One thing you don't usually see out on the plains is tornado damage in forested areas, simply because there aren't nearly as many trees. Below are a number of pictures I took of downtown Monson, along with the damage along Rt. 20 in Brimfield. Unlike the typical tornadoes we experience in New England in any given summer, these were legitimate supercell tornadoes, as opposed to the brief tornadoes embedded in squall lines we generally see. WGBH TV, Boston, MA "Greater Boston" show: On April 28th, 2011, A day after the massive tornado outbreak in the Southeastern United States, I appeared on the "Greater Boston" show to discuss the outbreak and the conditions that caused it. WGBH TV, Boston, MA "Greater Boston" show: On June 2nd, 2011, the day after an EF-3 long track tornado with a 39 mile damage path hit Massachusetts, I returned to the Greater Boston show to discuss that tornado and my experience in Joplin, MO about a week earlier. The steeple was ripped off the top of this church, and another one just up the road, in Monson Center. Significant roof damage in the neighborhood just east of Monson Center. Typical view of this damage path: Tree damage in the foreground, then you can see where the tornado went up the hill, knocking all of the trees down in it's path, then down the other side, etc. etc. Store in Monson demolished by the tornado. Monson High School was significantly damaged. Tree down on a house. This house was pushed right off it's foundation. A structure completely destroyed. The paneling was torn off the side of this warehouse. The National Guard would not allow the public to get any closer to this heavily damage neighborhood. Most of the roads heading south off Route 20 were blocked off. A closer view. Note all of the tarps covering roof damage. The next group of shots were taken driving east along Route 20. Massive tree damage for many miles all the way from Monson to Sturbridge.